DARPA wants you to do a solid for science. DARPA, better known as the Defense Advanced Research Projects Agency, needs your help. 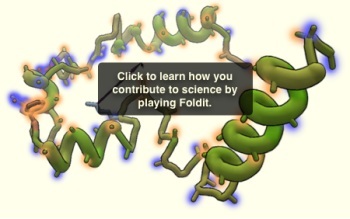 It's trying to find a cure for the deadly blood infection sepsis, and it's hoping to crowdsource the effort through Foldit, a puzzle game currently in beta that challenges players to "fold" proteins in order to predict their structures and design new ones. The name and the nature of the game are more than a little reminiscent of the distributed computing project [email protected], but the hope (aside from saving thousands of lives) is to demonstrate that humans can actually be more effective than computers at "certain aspects of protein structure prediction." "For protein structure prediction, the eventual goal is to have human folders work on proteins that do not have a known structure. This would require first attracting the attention of scientists and biotech companies and convincing them that the process is effective," the Foldit FAQ explains. "Another goal is to take folding strategies that human players have come up with while playing the game, and automate these strategies to make protein-prediction software more effective. These two goals are more or less independent and either or both may happen." The "Sepsis Design Puzzle" challenges players to design improved versions of the Mannose-Binding Lectin protein, which helps defend the body against invading pathogens. "The goal here is to use Foldit to improve MBL's sugar binding capabilities, allowing for its potential clinical use," the site says. "You will work towards this goal by redesigning specific regions of MBL in order to increase the number and strength of protein-sugar interactions." The most promising designs will be tested at Harvard's Wyss Institute for Biologically Inspired Engineering to determine whether they actually improve on naturally-occurring MBL. I've horsed around with Foldit a bit and while it's not likely the most fun you'll ever have in an afternoon, puzzle fans, particularly those with a taste for biotech, might get a kick out of it. And it is a very effective method of research: In 2011, it took Foldit players just three weeks to facilitate a breakthrough discovery about the design of an AIDS-related protein that scientists had been working on without success for more than a decade. You'll have to make your way through some introductory puzzles before you're given a chance to cure sepsis, however, and with the challenge winding down in just a few days, you might want to get a move on. Get the info, grab the software and put your brain to work for science at fold.it. Thanks to Antari for the tip.